September is an important month. The season’s bounty is in full bloom. Somehow those dreary months of winter when only cellared root vegetables and greens are available seem so distant. Heirloom tomatoes overflow from farm stands, pumpkins shine brightly in the sun, and apples arrive crisp and fresh off the trees. It’s like a rainbow, shades of every color draw you in, inviting you to indulge in far more produce than you could consume. September is aptly dubbed National Organic Harvest Month and also marks month-long NY Locavore Challenge, sponsored by the Northeast Organic Farming Association of New York (NOFA-NY). It’s hard to eat local year round. Even I slip up here and there. But with harvest so at its peak, it’s hard to not even try for a month. NOFA-NY invites you to join the challenge and provides hand holding tips along the way such as tips, encouragement, farmer stories and even local events. The NY Locavore Challenge isn’t about all or nothing. Habits take time to develop, but awareness and education can help make baby steps easier. Make a pact with yourself to shop at a local farmer’s market once a week. Try a new vegetable. Trade your favorite fruit or veggie for a local apple or carrot. 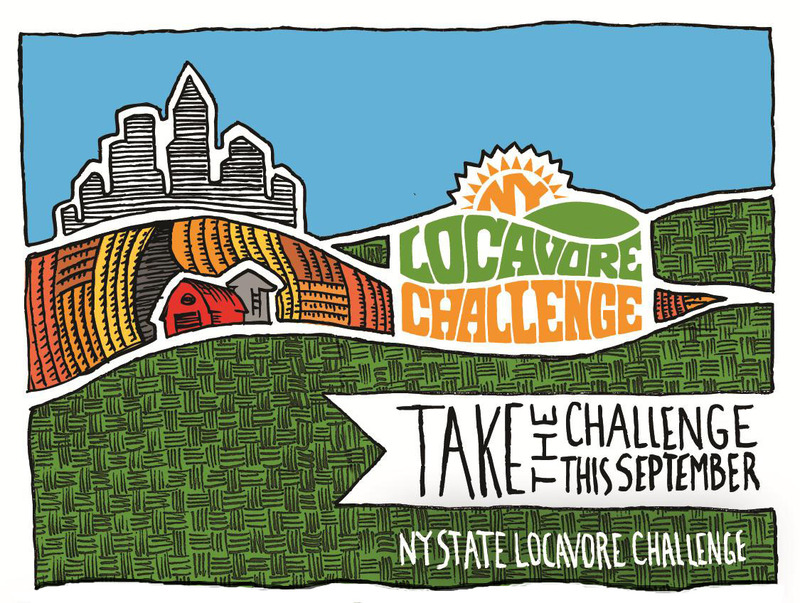 I encourage you to visit NOFA-NY’s site and sign up the NY Locavore Challenge. Even if you don’t live in New York, you can still peruse the helpful materials. Don’t worry, I won’t tell! What I really loved about last year’s challenge was each day was its own challenge. Enjoy locally crafted chocolate. Join a Winter CSA. Read a locavore book. I’m not sure the challenge will be as specific this year but I’m excited to follow along. I hope you’ll join me! I will definitely check the site out. Sounds great! Congratulations on making it to a runner up and being published! 🙂 I’ll go check it out! My sentiments exactly! can’t wait!